These glazed donuts are light, fluffy, and the best homemade donuts I’ve ever eaten. There is no donut-providing bakery anywhere near me, so what do you do when you’re hours away from a donut source? Become the source! Making donuts from scratch is my only option and my, what a delicious option it is. These are super delicious and fluffy! Everyone should make them! Oil for Deep Frying (one or two gallons depending on whether using a skillet or stock pot) Corn oil, canola oil, peanut oil - any oil works - pick what you like best. Can be re-used several times if stored in the fridge. Just let it cool and pour back into the jugs it comes in and refrigerates until next time. Turn dough onto floured surface; roll around lightly to coat with flour. (dough is sticky so using quite a bit of flour to help with handling / prevent sticking is key. Tip: be sure to lay your cut donuts out on a cookie sheet covered with plenty of flour to keep them from sticking to the pan, which will destroy them when you try to move them to the oil. You can't really have too much flour. To remove from pan, swiftly slide a spatula under the risen donut and then dump it into the oil. The extra flour will just wash off in the oil. Works great. Cover and let rise until double, about 30 minutes. They will rise more when fried. Heat vegetable oil in deep pan or stockpot to 350°. 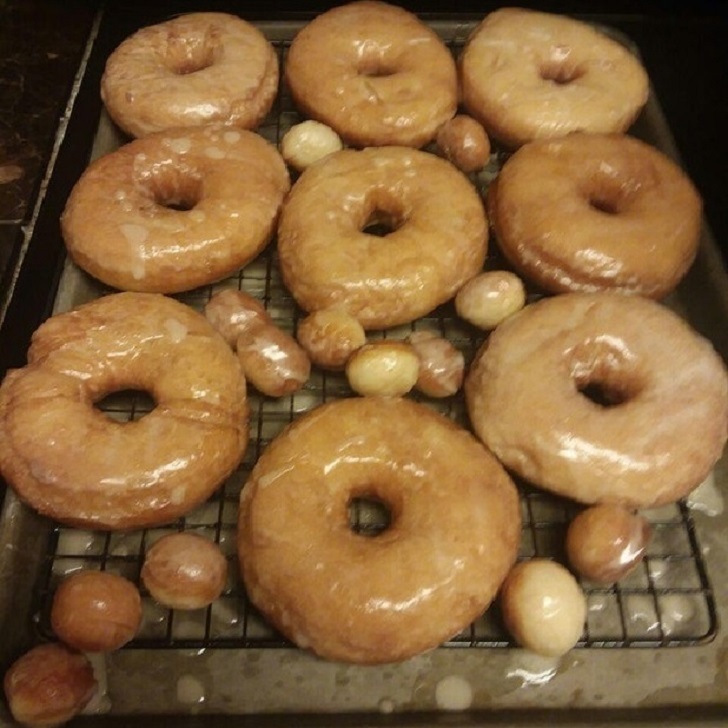 (I learned to get the oil hot before starting to rise the donuts. You don't want to over-proof them or they'll deflate when moving to the oil) Slide doughnuts into hot oil with wide spatula.